Who am I! When did Brussels Sprouts and Sweet potatoes become my vegetables of choice? For the past two months or so, every time I have gone to the grocery store, Brussels Sprouts have jumped into my basket. Every. Single. Time. So, it was the next logical conclusion that I would put all this together on a pizza. But the first time I made it, I knew it needed something else. That little pizazz that would make it worthwhile. Boom. Balsamic glaze. 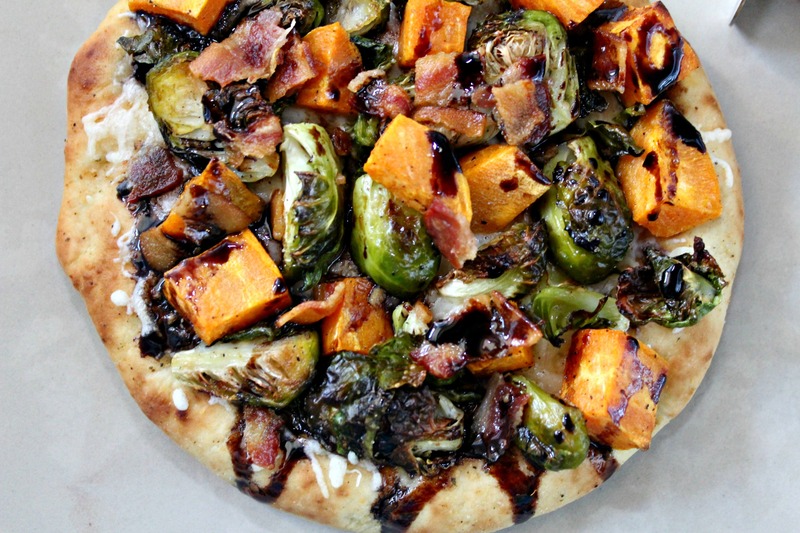 This easy to make glaze totally transforms this pizza. Now you can buy a balsamic glaze already made but it really is easy to make. I made this version. 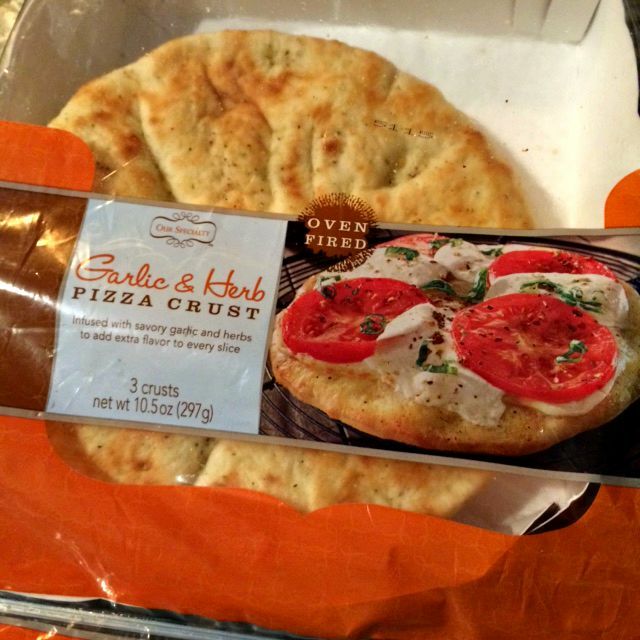 The pizza crusts I use are the ones I get at my local grocery store in their bakery section. I’ve raved about them here, here and here. And here’s a picture in case you want to see if you have them at your store. Totally worth getting them. Place sweet potato pieces and Brussel sprouts in a medium bowl. Add about 2 tablespoon of olive oil and toss to combine. Season generously with salt and pepper. Place vegetables on a parchment lined baking sheet. Bake for 20 minutes. Brush about a teaspoon of olive oil on to each pizza crust. Add 1/2 c cheese on top of each crust. 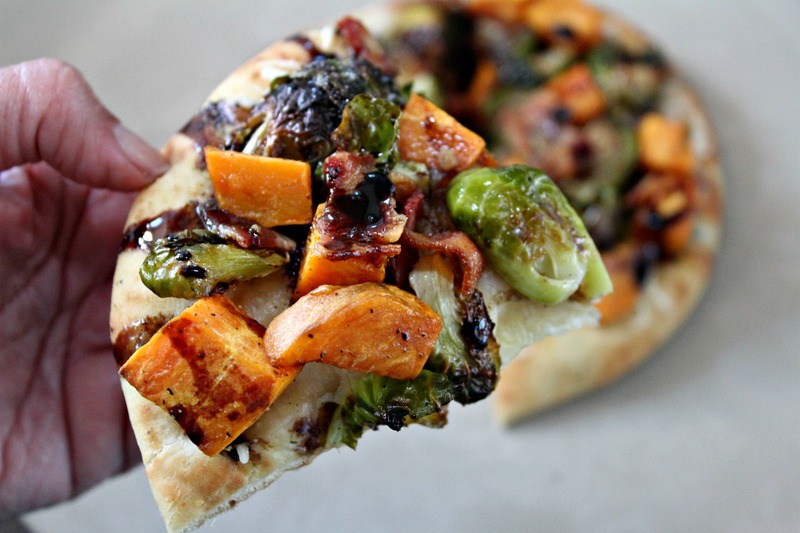 Divide vegetables among the pizza crusts. Place on a baking sheet and bake for 15 minutes. 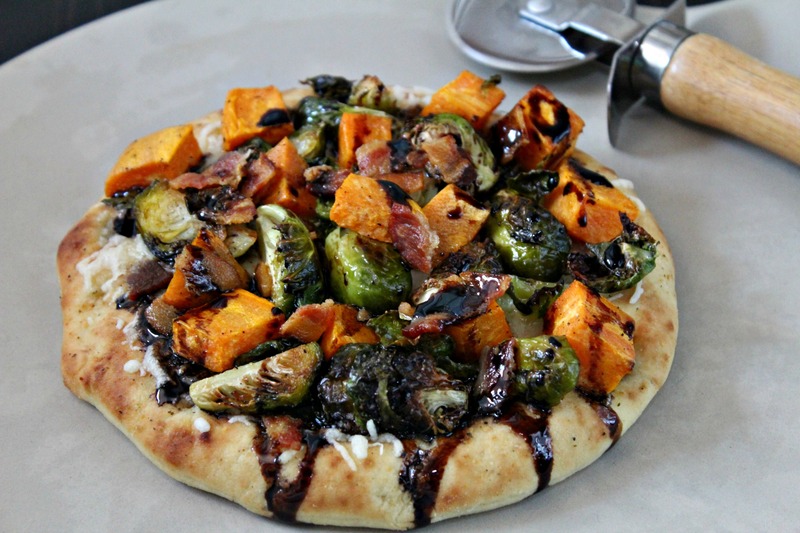 While pizzas are baking, make balsamic reduction. Add balsamic vinegar, sugar and salt to medium saucepan. Bring to a boil over medium heat. Reduce heat and and cook for about 20 minutes until sauce reduces by half. Remove pizzas from oven. Top with bacon and drizzle with balsamic glaze.